The global neuromicroscopy market is anticipated in a report by Transparency Market Research (TMR) to find players making strong investment in research and development to survive in the intense competition. With a view to stay ahead of the curve, players could focus on the development of new products. The market could also witness a rising count of players operating in the market. 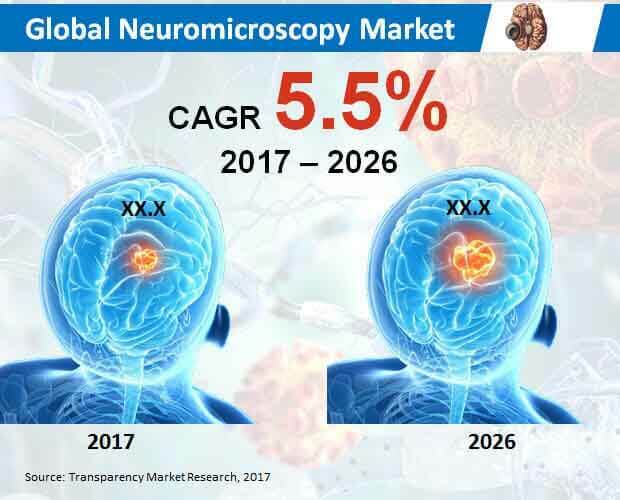 Some of the leading companies of the industry are Danaher Corporation, Carl Zeiss Meditec AG, and GE Healthcare Inc.
TMR prophesies the global neuromicroscopy market to expand at a 5.5% CAGR during the forecast tenure 2017-2026 to achieve a valuation of US$99.7 mn by the end of 2026. On the basis of product, devices could rank higher in the market. They are expected to bag an US$80.0 mn by the final forecast year. By region, Europe could take the driver’s seat of the market in the coming years. Demand for advanced neuromicroscopy is expected to surge with increase in incidence of genetic disorders and those related to the nervous system. With a view to understand complex nervous functioning, a number of organizations are conducting extensive research. Use of latest technologies could help manufacturers to develop high-end microscopes. With the help of near-infrared fluorescence, it could be possible to provide electrically processed images as researchers concentrate on the development of new augmented microscopy technology. This could help surgeons to minimize risk and operate with sound precision. Manufacturers are predicted to cash in on the opportunity to develop highly efficient products with recent increase in the use of surgical microscopes. Demand for standalone devices could increase in the near future. In terms of end user, hospitals could gather high demand during the course of the forecast period. In order to help understand and plan surgical approach, advanced 3D visualization technologies are provided in the world neuromicroscopy market as manufacturers focus on the development of new products. The international neuromicroscopy market is prognosticated to find expensive excise and custom duty imposed by governments of different countries to negatively affect its growth. Furthermore, high cost of advanced microscopes could loom over the market as a threat to demand for neuromicroscopy. However, constant efforts to introduce new technologies in the international neuromicroscopy market are projected to create ample of opportunities in the foreseeable future. Surgeons could be helped with advanced imaging technologies such as laser-based microscopy to achieve successful results in surgical operations. Thus, advancement in technology could prove to be extremely vital for the development of the market. Another trend observed in the market is the integration of virtual reality in microscope imaging systems to help surgeons attain success in neurosurgeries.